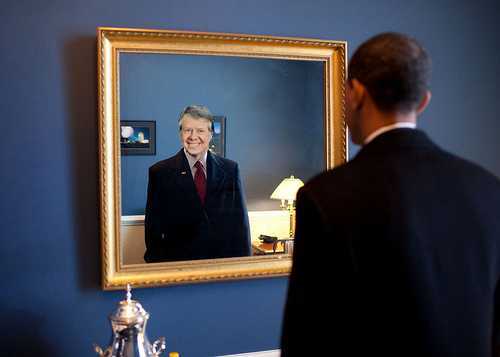 WOW, WHO WOULD EVER HAVE THOUGHT THERE WOULD EVER BE A PRESIDENT WORSE THAN JIMMY CARTER … ENTER BARACK OBAMA. Say hello to Barack “Jimmy Carter” Obama or is it Barack “Hoover” Obama? President Obama has been a complete failure and he knows it. According to Washington Whispers, Obama is 5 x’s worse than former President Jimmy Carter on the economy. YIKES!!! Every policy he has attempted has been one miserable failure after another. Whether it was the $787 billion stimulus that funded not so shovel ready jobs, cash for clunkers for what his first term can be dubbed nothing short of a clunker. Two new polls today find that just one third of the public feels President Obama deserves re-election while five times more Americans think Obama has done a worse job fixing the economy than Jimmy Carter, the modern era’s Herbert Hoover. Washington Whispers contributor John Zogby tells us that his new polling is spirit-crushing for the depressed White House. “It was a very bad week for Barack Obama. Our polling shows his job approval at 39 percent and the percentage saying he deserves re-election at 33 percent, both the lowest of his term, while the percentage of voters saying the nation is on the wrong track reached a high since he took office at 75 percent,” he said. Enough of the excuses Barack Obama. No one forced you to run for the Presidency and if you did not know how bad the economy really was, why were you saying it was that bad during the 2008 election? After all you were in the US Senate for 2 years. President Obama – 47 percent. George H.W. Bush – 40 percent. Jimmy Carter – 8 percent. Ronald Reagan – 5 percent. What a shock that only 18% of Americans think the country is headed in the right direction , only 18% say that today’s children will be better off than their parents and in poll after poll Barack Obama is falling faster than an ACME anvil targeting Wiley W. Coyote. EXIT QUESTION: 5 times worse than Jimmy carter, does that mean the 2012 landslide will be 5 x’s worse as well? One can only hope. So GWB was a cowboy, eh? Looks like the Arab world respected the man in the hat more than the one with the teleprompter. Didn’t Barack Obama promise that relations with the Arab would were going to change under his leadership? Who knew that meant for the worse. Well, actually many of us, but then again we did not vote for the carnival barker who promised “Hope & Change”. From Salon comes the following, what a shock this must be to the LEFT. But Barack Obama promised he would make us more liked on the Arab Street.